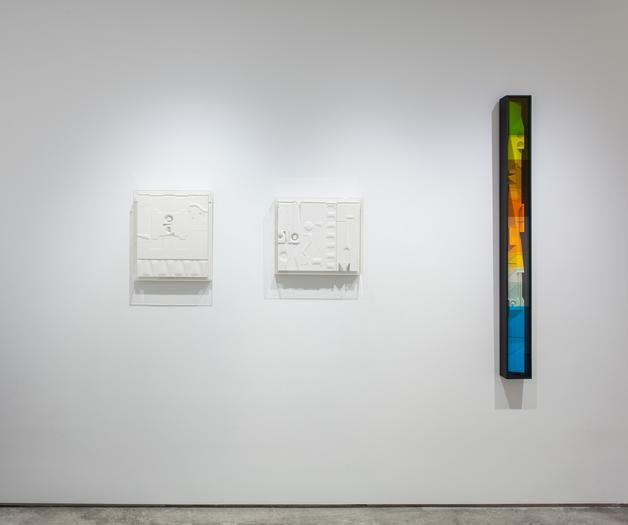 DRISCOLL BABCOCK GALLERIES presents Abe Ajay: Plastic Architecture – an exhibition of the artist’s innovative wall works from the 1960s and 1970s which combine non-objective painting and sculpture. Ajay integrated his pure architectural sensibility with carefully calculated prismatic color. After initially employing the found object, Ajay embarked on a study and creation of individual forms in which he saw expressive possibilities. These forms, of wood and later of polyester resins, which he made to exacting standards, replaced found objects to become his “Alphabet” from which he assembled his signature imagery. Ajay’s use of carefully designed forms and color arrangements was a vital alternative to the black and/or white found object compositions of Louise Nevelson and the flat surfaces and reserved palette of Ad Reinhardt, in addition to the more lyrical mobiles and stabiles of Alexander Calder. 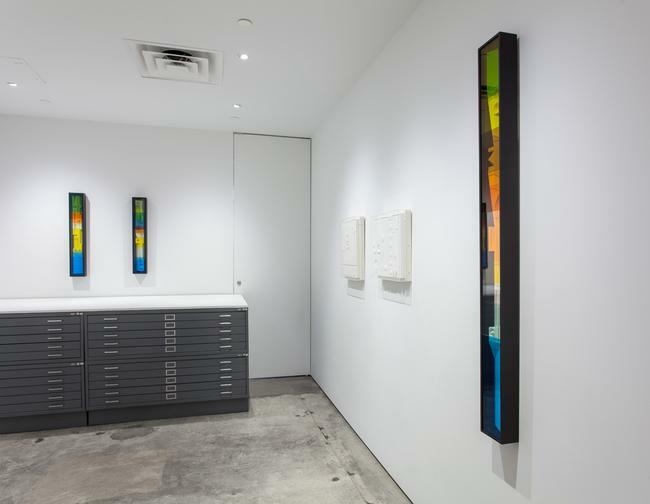 In the Plexiglas Series Ajay’s alphabet forms are encased in elongated boxes with prismatic Plexiglas overlays. 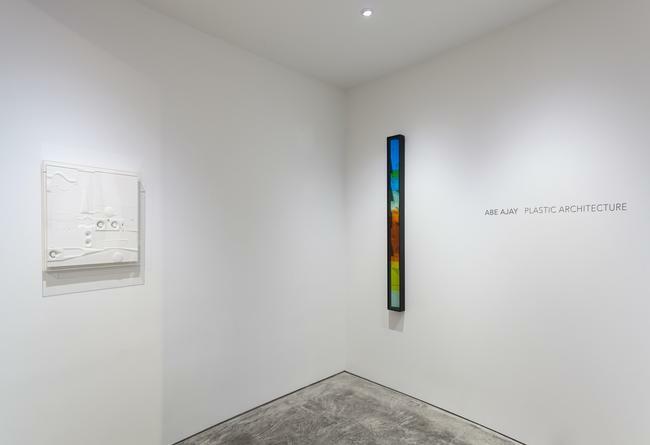 The combination of translucent Plexiglas layers allowed the artist to create hues that were literally available nowhere else, whereas the Relief Sculptures present a pure white surface, the embodiment of all colors of the spectrum. The Relief Sculptures are an intriguing visual expression: an integration of very precise control and the fortuitous power of accidents that arise from cracks, bubbles and surface pits during their creation. The resulting works in Plastic Architecture feel both archaeological and futuristic and are the ultimate expression of Ajay’s aesthetic of perfections. Driscoll Babcock has represented the work of Abe Ajay for more than twenty years. Ajay has been the subject of more than 25 solo exhibitions at galleries and museums throughout the country. His work is included in major public collections including the Solomon R. Guggenheim Museum, Metropolitan Museum of Art, Hirshhorn Museum and Sculpture Garden and the Pennsylvania Academy of the Fine Arts. Lee Hall’s monograph Abe Ajay (University of Washington, 1990) was also accompanied by the film Abe Ajay: Dimension x 3. Ajay’s work has been consistently reviewed by major publications including Art in America, Arts Magazine and the New York Times. Segments of the famous correspondence between Ajay and Ad Reinhardt were published by Art in America.